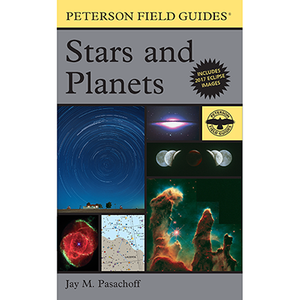 This 4th edition of the popular and everlasting Peterson Field Guide, Stars and Planets by Jay M. Pasachoff, features more color, photographs, and a cleaner, brighter look. Designed to work in the field, Stars and Planets, is written by an author with expertise in the subject and includes time sensitive material valid through 2020. 577 Pages. Twenty-four Monthly Sky Maps, revised and in color, show exactly what you’ll see when facing north or south in the night sky. Fifty-two Atlas Charts, by Wil Tirion, also revised and in color, cover the entire sky, including close-ups of areas of special interest such as the Pleiades and the Orion Nebula. Two dozen pages cover the August 21, 2017, total solar eclipse whose path crosses the continental United States, how and where to view it, and other aspects of current and future solar eclipses.